Where are you? Home » News » How important is price? - Differentiation focus, where focused differentiation is offered in a niche market, again this reduces the potential market. Have a look at your own market, you should be able to easily place all your competitors in each of these categories. More interestingly could you be better served operating in a niche? 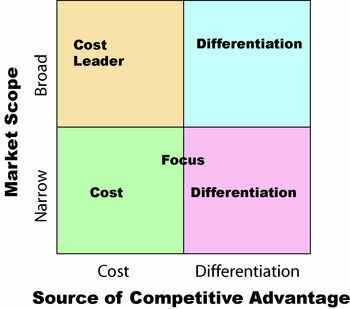 Or is there an opportunity to become the cost leader? For your interest REO would generally consider ourselves to offer differentiation focus, able to concentrate on niche markets and with a high technical content. Porter also argued that for a given market, there could only be one effective user of each individual strategy. Of course in reality this rarely happens, but instead this generally serves to reduce the margin in a given market and increase customer power and choice. REO have many, better known, competitors who are doing a great job in making mass produced, cost focused products, with little scope for modification or tailoring to suit a customers particular needs. Of course, this is where REO is able to offer our strengths to focus on helping our customers differentiate themselves from their competition by focusing on a market and addressing the needs of the few rather than trying to simply appeal from a low price perspective. So is price important? of course, and of the utmost importance if you are trying to be the cost leader, if you are not then market research, focused R & D and a market orientated sales effort is.